The Dow Jones initially jumped as much as 86 points to 11406 after Berkshire Hathaway’s announcement to invest US$5 billion in Bank of America. However, sentiment turned sour following Finland's demand (that Greece put up collateral for its share of loans) threatened to derail the latest Greek bailout. The Dow Jones continued to head southbound and fell 177 points at 11150 on profit taking activities, amid higher-than-expected weekly jobless claims and investors await the outcome of a central bank symposium in Jackson Hole tonight. After surging 6% from 10801 (19 Aug low) to yesterday’s high of 11406, the Dow Jones retreated 177 points to 11150 on profit taking activities as investors are looking ahead to Bernanke’s speech tonight for indications of whether the central bank will embark on further stimulus, especially when there is persistent policies deadlock between Obama’s administration and the Republicans. 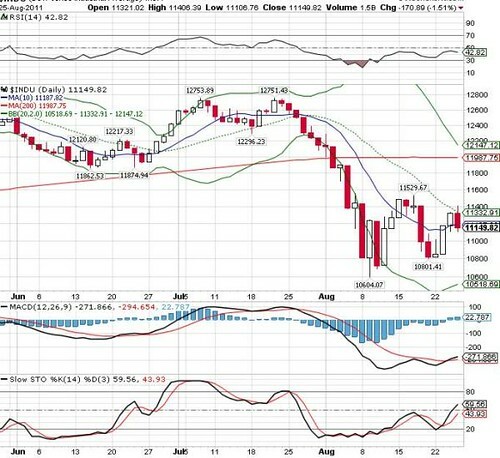 Technically, a fall below the 10-d SMA yesterday and the failure to surpass the mid Bollinger bad at 11133 and 11530 (17 Aug high) could derail the current rebound, especially if Bernanke speech fails to live up to market expectations of more dramatic action rather than outline gradualist measures. Immediate resistance levels are 11530 and 11987 (200-d SMA) whilst supports are situated near 10801-11000.